JUVÉDERM ® VOLBELLA ® with Lidocaine is a new dermal filler based on hyaluronic acid (HA) to the lips and perioral area. For the softest touch and delicate areas. Treatment of superficial wrinkles and skin depressions medium. Juvéderm® VOLBELLA with Lidocaine is a sterile pyrogen-free physiological solution of cross-linked hyaluronic acid gel which is not of animal origin. JUVÉDERM ® VOLBELLA ® with Lidocaine is a new dermal filler based on hyaluronic acid (HA) to the lips and perioral area , which was developed specifically for a natural look and minimizing swelling. JUVÉDERM ® VOLBELLA ® with Lidocaine Juvederm ® completes the range and has been developed from the exclusive VYCROSS Allergan ™ technology, providing the results to the natural appearance and a large rémanence. One syringe contains 1mL of Juvéderm® VOLBELLA with Lidocaine. Each box contains 2 Juvéderm® VOLBELLA with Lidocaine syringe, 4 single-use 30G1/2” sterile needles specifically intended for injecting Juvéderm® VOLBELLA with Lidocaine, an instruction leaflet and a set of labels in order to ensure traceability. The gel is presented in a graduated pre-filled disposable syringe. Juvéderm® VOLBELLA with Lidocaine is an injectable gel implant intended for the treatment of any fine lines and medium-sized skin depressions due to conditions such as premature aging. 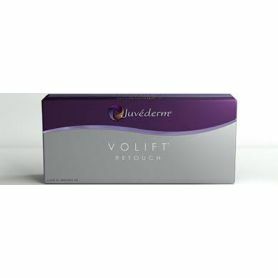 Juvéderm® VOLBELLA with Lidocaine is intended to be used via superficial or mid-dermis injection or lips mucosa injection by an authorized medical practitioner during treatment. Increased volume and ourlement lips. ◦ Redraw the outline of the mouth to sublimate the definition and lip line. ◦ From redefine the area of ​​philtrum (Cupid's bow). ◦ From Filling perioral wrinkles and marionette lines. ◦ To increase lip volume for better symmetry. ◦ To treat the corners of the mouth. JUVÉDERM ® VOLBELLA ® with Lidocaine is the only dermal filler lip to receive a validated demonstrating efficacy up to 12 months in a single treatment † clinical study, which minimizes the effect of swelling compared to other fillers dermique2, allowing patients to resume their daily lives faster. JUVÉDERM ® VOLBELLA ® with Lidocaine is injected directly into the lip and perioral area to temporarily restore lost volume and smooth wrinkles. The main component of Juvederm ® range is the AH, derived from a naturally occurring sugar in the body which keeps the volume and elasticity of the skin substance.